From my dolphin swim layout that I posted yesterday, I used 3 specific sized photos because I tend to be a very precise/linear type scrapper. I’m not good at winging it for sizes, page placement, etc. If you know me, you’ll find that completely hilarious as math is not my strong suit at all! 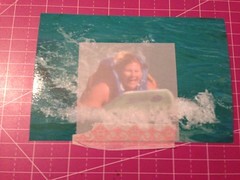 I want to share how I cropped the pictures to grab exactly what I wanted from the 4×6 print. I know I could edit them before printing but I’m not very diligent about that. I can’t be alone on that can I? Definitely not! Simple Stories just came out with some photo crops to do precisely that job! Well, here is my version. All you need is a little vellum and some washi tape, it’s really that simple. Pardon the glare on the photo! So, I took some vellum and measured out the size I wanted my photo to be, laid it over the 4×6 and I could see exactly what part of the photo I was getting in that size, stuck it down with washi and put it through my trimmer. I’ve seen the Simple Stories ones used with scissors, but I’d be too afraid of the crop shifting, or not getting as straight and clean a cut as I’d like. The washi is great to use because it’s not overly sticky and doesn’t leave a residue behind, and I have more washi than I think I’ll ever use. I hope you find this little shortcut useful for cropping your photos! This is such an amazing idea! I would love for you to share it on the ScrapMuch? blog one Wednesday?? Pretty please!